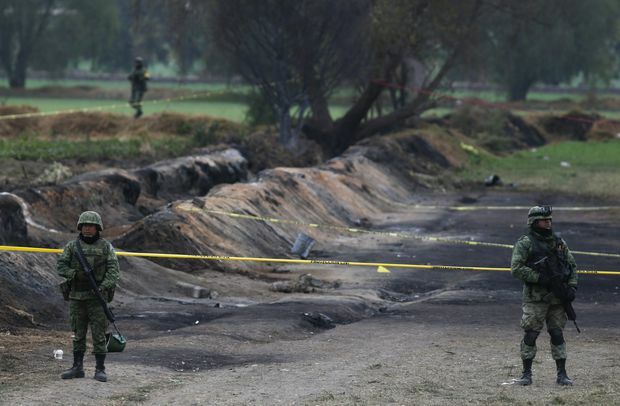 Soldiers guard the site where a gas pipeline exploded, in the village of Tlahuelilpan, Mexico, on Jan. 20, 2019. A blast at a gasoline pipeline in Mexico that killed 85 people has directed renewed scrutiny toward the new president’s ambitious strategy to stop fuel theft, his first major offensive to stamp out corruption and organized crime. Some relatives of the victims said fuel shortages stemming from President Andres Manuel Lopez Obrador’s plan led people to fill plastic containers with gasoline on Friday at a leak in the Tula-Tuxpan pipeline, a few miles (km) from a major refinery. Up to 800 people gathered to collect fuel from a 7-m (23-foot) gasoline geyser, officials said. Two hours later, it erupted into flames. The government has not yet clarified details of the disaster, and questions are arising about what caused the leak, how long it took officials to respond and why authorities did not do more to clear local residents from the leaking pipe. However, it has recently been disclosed that Mexico’s state oil firm, Pemex, did not close the valve at a leaking gasoline pipeline when first notified because it was not initially thought to be an “important” leak, Mexico’s security minister said on Sunday. Half a dozen people told Reuters their relatives went to the leaking duct in Hidalgo state’s Tlahuelilpan district in central Mexico because they had been struggling to find fuel and were desperate to fill up cars to get to work or run their farms. “A lot of innocent people came here, perhaps their car didn’t have enough gasoline for tomorrow, and they said: ‘I’m just going to go for a few litres,’” said farmer Isidoro Velasco, 51, who believed his nephew Mario Hidalgo was likely killed. Hidalgo would have turned 34 on Saturday. The initiative, if successful, would mark a victory for the veteran leftist who won last year’s election on promises to root out endemic corruption, strengthen ailing national oil company Pemex and ensure stable fuel prices. Failure, however, would likely not only erode his popularity but pose risks for the economy, the world’s sixth-biggest fuel market. An opinion poll last week showed the fuel strategy was a polarizing issue, with about half the population supporting the measure despite long lines at gas stations and other difficulties. Lopez Obrador said he hoped that supply would normalize soon as Mexico buys more tanker trucks for distribution by road. But the president, who took office last month, has repeatedly been asked why soldiers deployed to guard the duct did not chase people away from the leak, and how quickly the pipeline was shut down after Pemex detected the rupture. Pemex initially took the pipeline out of service in late December as the government tried to protect it from gangs who had hit it 10 times in Tlahuelilpan, Pemex Chief Executive Officer Octavio Romero told a news conference on Saturday. Romero said Pemex closed a valve at the pipeline on Friday after noting a drop in pressure from the leak. Pemex was aware of the leak at 4:50 p.m., he added, but did not say when the valve was shut. Fuel spurted from the pipeline for around two hours after Pemex alerted other authorities to the leak, with no visible loss of pressure before the explosion, Romero said. Pemex had been in a rush to reopen the pipeline to avoid a new wave of gasoline shortages in Mexico City, said Gonzalo Monroy, the head of Mexico-based energy consulting firm GMEC, citing conversations with oil industry professionals. The fissure occurred at a spot in the duct that Pemex had previously repaired, but gave way under the pressure of a new surge of fuel, Monroy said, citing sources in the company. Pemex officials decided to keep fuel running after the first signs of a leak, and send a team to inspect it, he added. Lopez Obrador said prosecutors would investigate the matter, but that even if the valve were closed immediately, there would have been 10,000 barrels of high-octane gasoline in the section of pipeline between the Tula refinery and the village. The Defense Ministry and Lopez Obrador said the army, which had just 25 soldiers present before the explosion, did not want to hold back the crowd. Critics say authorities should have called for reinforcements and been firmer in sealing off the area. Lopez Obrador said the soldiers told villagers not to get too close but were ignored.